Every city has its color in mind if we think creatively. Mardin, for example, is yellow. Erzurum is white. Artvin is green. But it would be difficult to describe Kastamonu with a single color, for this is a city of predominantly two colors, blue and green, with scores of shades in between. 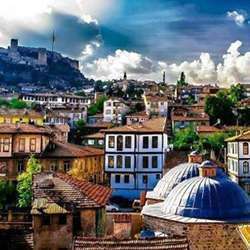 The moment you arrive in this wise city which has a 7,000-year-long history, a variety of handcrafts and nearly a thousand local recipes, you feel that you are visiting one of Turkey’s tourism havens as it is home to a living culture that exhibits all the refined values of Anatolian Turkey. We will take a wonderful tour of the city and the surrounding area with our professional tour guide. Kastamonu hosts a number of very precious samples of our traditional architecture. One of the landmarks of Kastamonu we will visit is The Çivisiz or Nailless Mosque. It is a perfect masterpiece. Built in Protected content Emir Mahmut Bey, it appears quite simple from a distance. But as a rare example of the technique of dovetailing the wooden elements without the use of nails, this mosque is as unusual in its construction technique as it is in its decor. A UNESCO temporary listed this year, Mahmudiye Mosque is another must see in our tour. Other historical and cultural highlights on our discovery list are Kastamonu Castle, Hat museum, Hz. Pir Seyh Saban-i Veli Kulliyesi and halva tasting ( a very funny activity). There are also a dozen of old Ottoman Mansions in the city. While one of them will be our hotel that we will be staying at, the other one we will visit is Liva Pasha Mansion Ethnography museum. We will go there to see the artifacts that represent city's thousands of years long history. Zimbilli Hill tumulus, the ancient city of Pompelopolis and the archeology museum there are among the significant architectural and historical sites around the city that we will also visit. We will spend some time in the National Park surrounded with oak&fir trees. You can experience the beauty of heights with telesiege and enjoy the breathtaking winter scenery from high above or join our ski group and try skiing. 'Dipsiz Göl' mening Lake without a bottom takes its name from being very shallow on the beaches but axtremely deep right in the middle. If the road is clear enough for a ride we will also go there to take pictures and enjoy the scenery. We invite you all to experience Kastamonu's unique and tranquil atmosphere with us. Join us for discovery, adventure, health, friendship, fun & laughter. PS: Departure is on Friday night, if the rooms are ready, we will check~in to our hotel early in the morning and have a chance to sleep a few hours before the day starts.